From today, our Finest Knitwear is available to buy in the online shop. 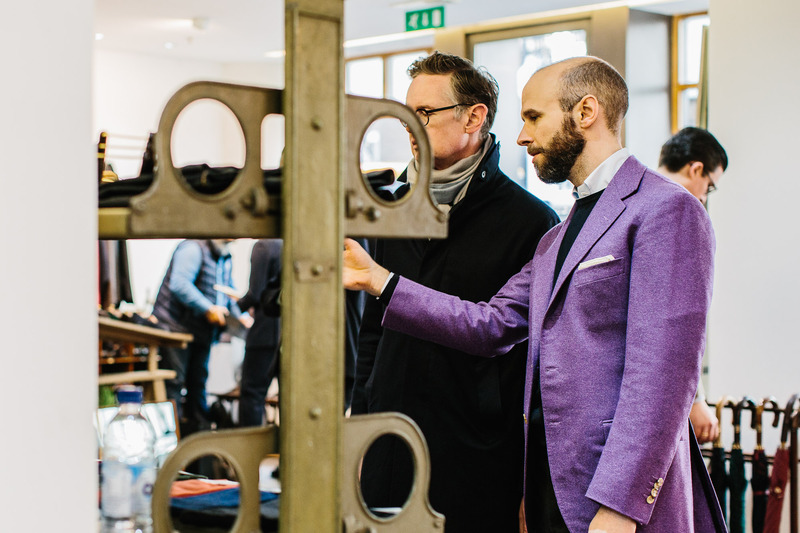 There was a lovely reception to it in the Savile Row pop-up, with dozens of readers coming in to try and to buy. But I'm pleased to say that we still have both V-neck and crew-neck in all four sizes (S, M, L, XL) for other readers around the world. In terms of sizing, please refer to the measurements below. As with the Friday Polo, we highly recommend that you compare these measurements to knitwear you already have, rather than try to guess the size from other 'M' or 'L' sweaters from other brands. I should also say that, again like the Friday Polo, the fit is to a certain extent a matter of personal preference. The knit/weave of both pieces means there is a lot more flexibility in the fit than with a dress shirt, for example, and is never going to be uncomfortable. How close you want it to fit is up to you. For those who are hearing about our newest collaboration - The Finest Menswear - for the first time, here is the background. The aim of this collaboration was to create the perfect knitwear for wearing under tailoring: a luxurious wardrobe staple (if that's not an oxymoron). We are calling it the Finest Knitwear because it uses one of the finest merino yarns you can buy (and the finest knitting gauge) and because it is the best knitwear of its type available anywhere. It is a beautiful and highly practical piece of clothing, and yet - primarily as a result of our low costs - only £190 (ex-VAT). 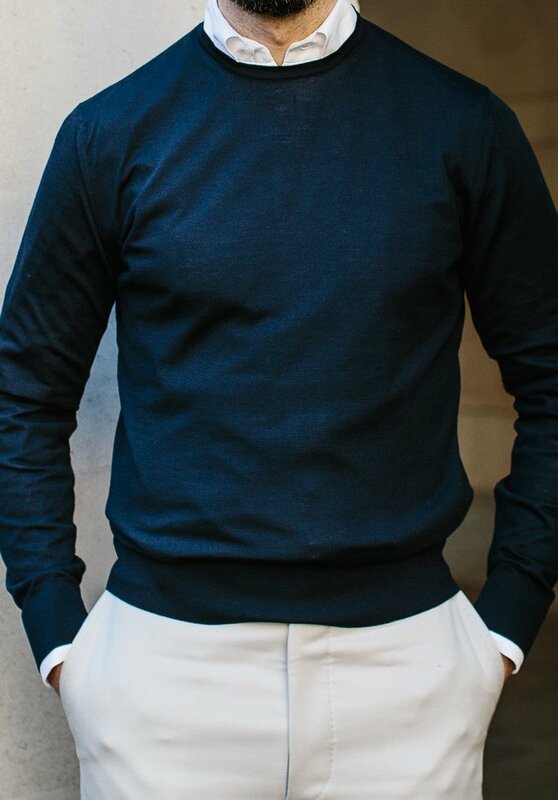 It comes in one colour - navy - but two styles: crewneck and V-neck. 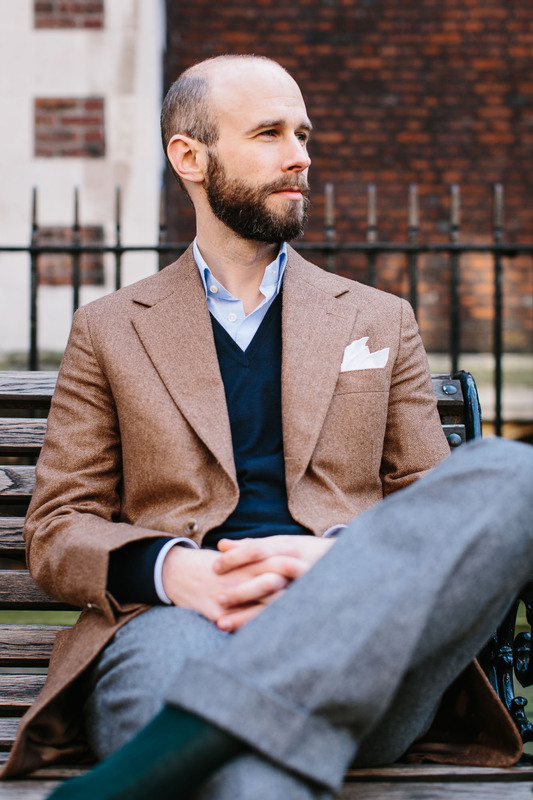 Navy is by far the most versatile colour for knitwear with tailoring, given it goes with pretty much every other colour, and itself. However, I know there are guys that swear by both crewnecks and V-necks, and so we produced both. For me, the crew is a little more casual. But both work under tailoring. 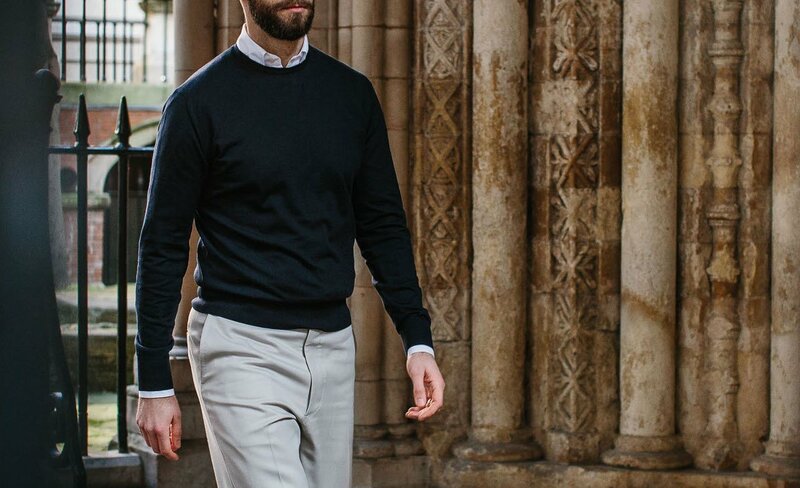 A piece of fine-gauge navy knitwear might seem like a simple thing to design, but there are so many beautifully subtle ways it can be improved. 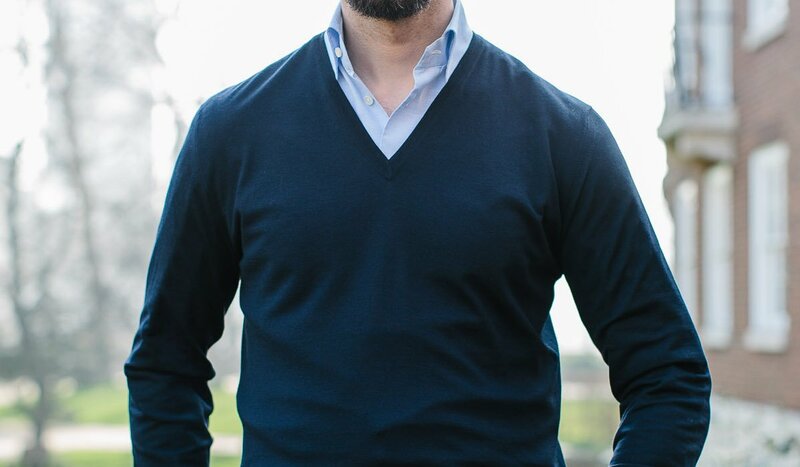 The crewneck, for example, has an ever-so-slightly larger collar, in order to give a shirt a little room to spread out around the neck. The V-neck, similarly, has a slightly lower opening than normal, to flatter the wearer and better reflect the line of a jacket’s lapels. As with other Permanent Style collaborations, both designs are cut relatively slim, to avoid any bulk under tailoring. And while we haven’t altered the body length or the sleeve length, we have lengthened the ribbing on each - to 7cm from 6cm. 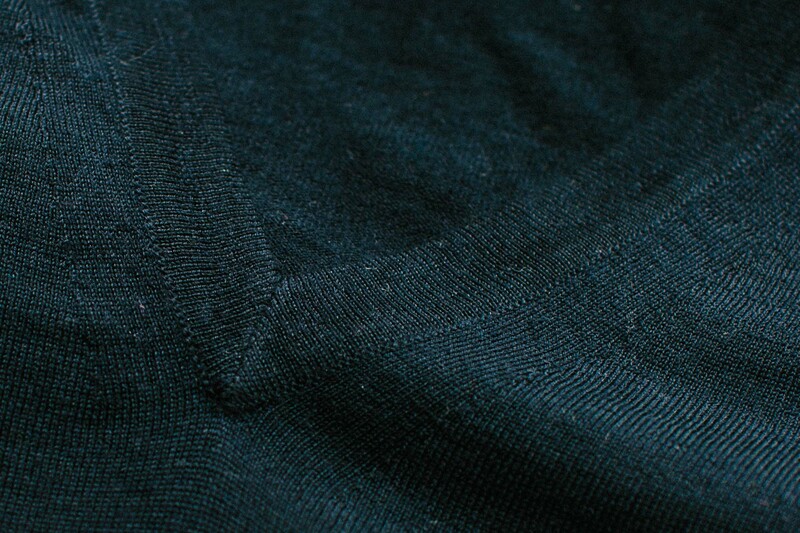 Interestingly, this makes the cuff of the sweater look a little dressier, which is a nice thing with tailoring. 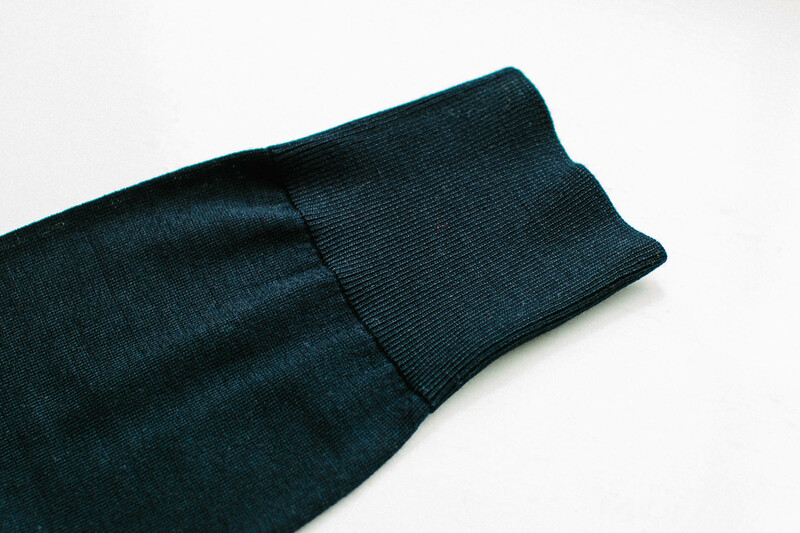 And increasing the ribbing at the bottom has the effect of raising the body of sweater slightly - reflecting the general aim in tailoring of lengthening the leg relative to the body. 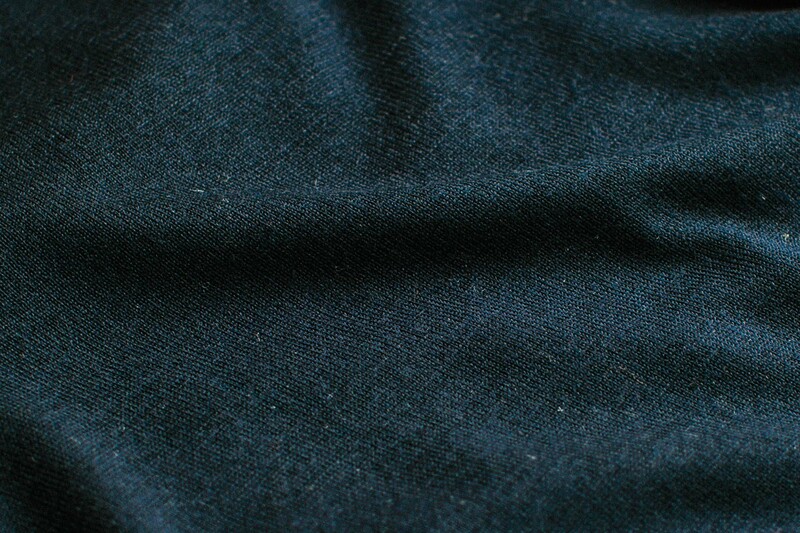 The Finest Knitwear is deliberately made in merino, and not cashmere (or a cashmere/silk mix). Cashmere is lovely, but the finer it is knitted, the more likely it is to pill and to lose its shape. Fine merino, on the other hand, approaches cashmere in its feel but pills less, holds its shape, wears better and looks sharper. After several iterations, we opted for Loro Piana Wish, a 15-micron two-ply merino. We decided to make our knitwear with a factory called Umbria Verde in Italy. I’ll write about his factory in a separate post, but it was founded in the 1960s when his father bought up several old English cotton-knitting machines, and began adapting them to deal with finer gauges. Today it specialises in ‘superfines’, using an adapted knitting bed to knit at 37 gauge (the number of needles to the inch). Smedley’s fine knit, by comparison, is 30 gauge. This makes the knitwear fine, but not particularly delicate - certainly compared to cashmere. It fits under any jacket, no matter how slim you like them cut. And it provides a notable layer of warmth without being too heavy. For me the Finest Knitwear is perfect for travelling, particularly given it folds up small and is so lightweight (150g). And I find I wear it around the office a lot - when the air conditioning can mean it is often warm, but I don’t want to be in just a shirt. Just as with the merino and the knitting, we asked the factory to pull out all the stops when it came to making up the knitwear. There are many of these tiny, almost unnoticeable yet (for me) highly pleasurable details. I’ll restrain myself and pick just three. First, note the join between the body and the sleeve. This is almost twice as wide as on a piece of Smedley knitwear (for example) and as a result, thinner and flatter. 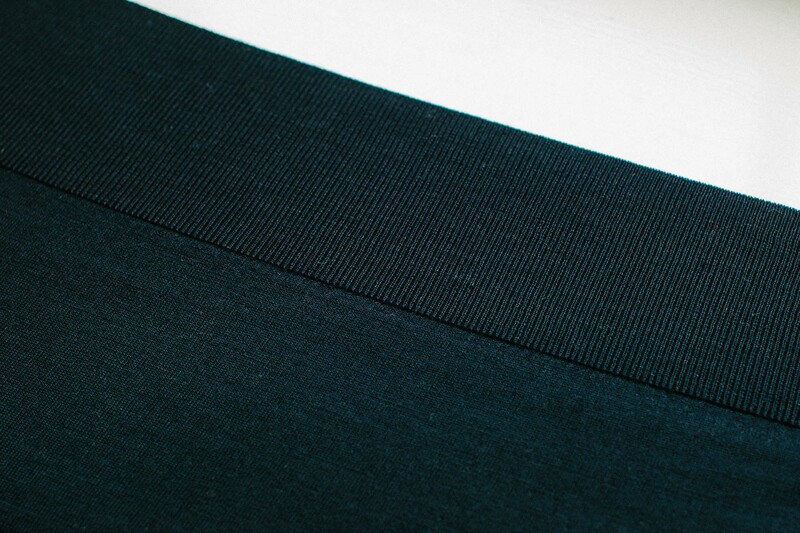 As with the same seam on a bespoke shirt, having the seam flatter (and indeed, curved) makes it more comfortable. 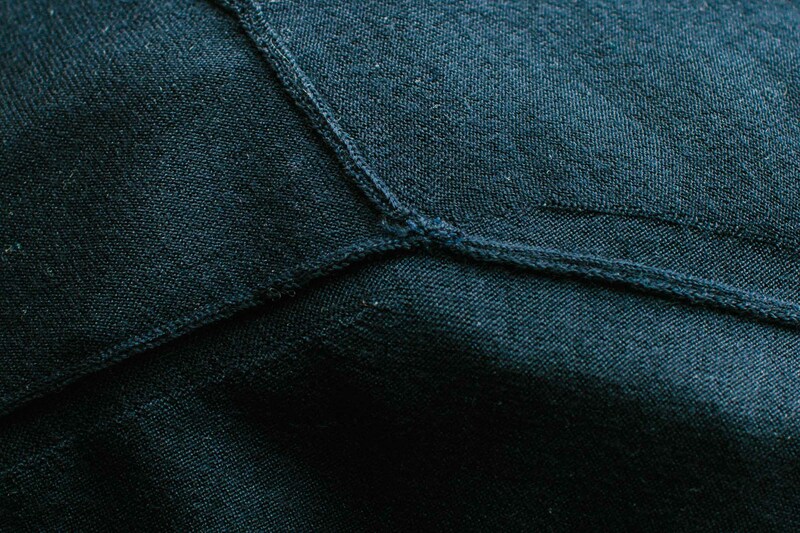 Second, look at the shoulder point inside the garment (above), where the shoulder and two sides of the sleeve meet. On most knitwear there is a hard little knot here, where the yarn is folded back on itself. With ours, the point is flattened out and re-stitched, so the knot is removed. And thirdly, the back of the ‘V’ on the V-neck. It’s hard to show this in a photograph, as it is really an absence rather than a presence. 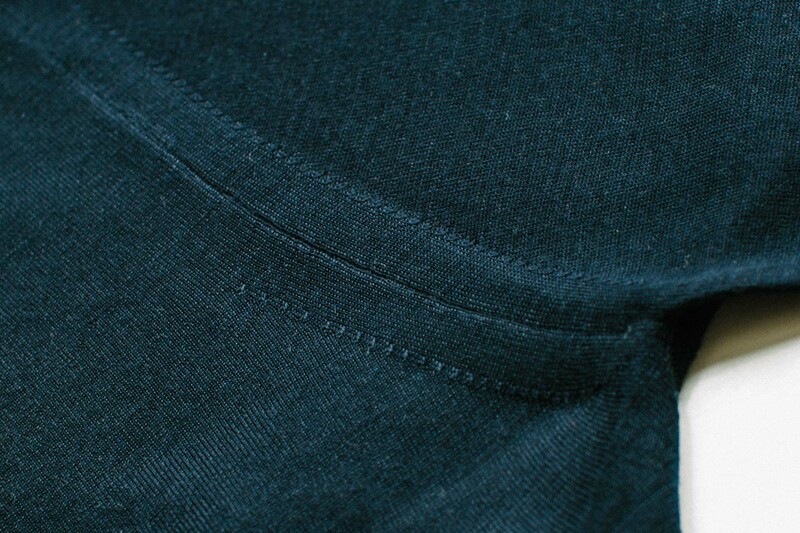 On a normal piece of knitwear, there would be hard little seam here between the two side of the V. With ours, it is knitted as one piece, so there is no seam. The Finest Knitwear is available to all readers through the online shop. Both designs are priced at £190 (ex-VAT) - great value for knitwear of this quality, which luxury brands would have at over £300. You can follow the discussion on The Finest Knitwear – now available online by entering your email address in the box below. You will then receive an email every time a new comment is added. These will also contain a link to a page where you can stop the alerts, and remove all of your related data from the site. Simon what size do you take in the knitwear? This one isn’t for me, as I have about half a dozen near-identical Smedleys already and therefore need to prioritise other purchases. However, I did manage to get my hands on one of these in the PS pop-up shop on Saturday and can confirm its incredible feel and quality. Anyone looking to buy one of these will not be disappointed in the least. Simon, you were deep in conversation when I arrived so I didn’t want to interrupt. I did however hear you mention another potential PS collaboration idea, which sounded like a really excellent item and one which I’d certainly be interested in buying! I hope it comes off. I comfortably fit in Smedly XL (and most other brands of this size) but the XL of your jumper is much too small, most surprisingly was the narrowness of the sleeves. It is however fantastic material so will keep and add to the reasons to lose weight. Is the jacket in the photos the oatmeal one or a different one? Your shelves in the shop had a note about buying them but we misplaced the details. Can you share? This looks to be another beautiful Permanent Style creation, but I would love to see larger sizes next time for those of us who wear large and extra large in the Friday Polos. Based on this thread it looks like there would be demand for larger sizes. Do you plan to extend the line to include cardigans and / or rollnecks? I see your posted measurements, but may I ask, if the large size in your latest batch of Friday Polo shirts fit me, would I also order a large for Finest Knitwear sweater? The medium in the Friday Polo shirt is too small across my shoulders; the large fits fine. A medium in a standard fit John Smedley sweater also fits me fine. Any plans to do a sleeveless Cardigan soon? “For those who are hearing about our newest collaboration – The Finest Menswear – for the first time, here is the background.” – Perhaps you mean Knitwear? Or is TFM actually a clothing line that starts with this sweater and will include other items in the future, which you tried to keep under wraps and let slip by saying Menswear? Tell me it’s true! Hahahaha. In any case, another beautiful collaboration. Cheers, Simon. Oh, well. A man can dream. Thanks for clarifying, have a smashing day! Simon, I currently wear Smedley v-neck knitwear, the Bobby model specifically, size large and it fits very well. I’m intrigued by you knitwear as it appears to be at a higher level than Smedley,based on your write up, in terms of construction and fabric. Would your V-neck in size large fit in a similar manner as the Smedley? The fit is similar, yes. I wear a medium in both and the Finest Knitwear is perhaps a tiny bit trimmer, particularly in the waist. 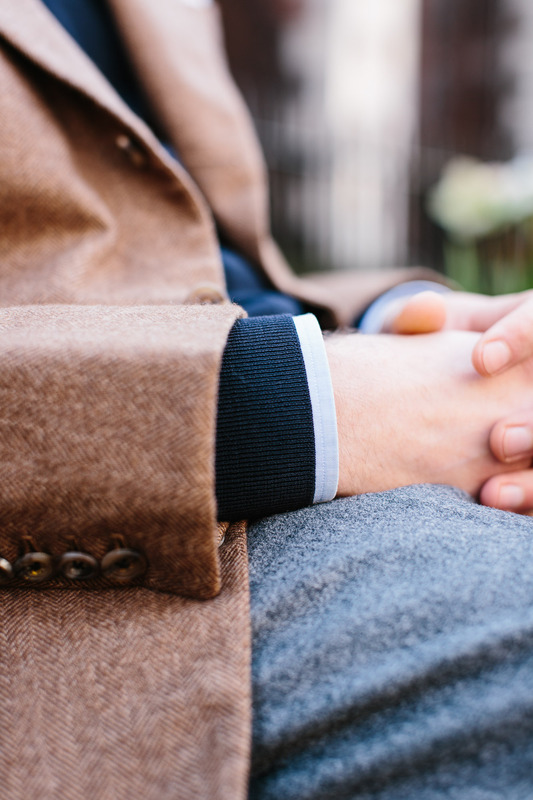 As mentioned, we do recommend comparing the measurements to those of your Smedley, however. I am curious about the end of your introduction. Is there any difference between seams with and without the little hard knots? More comfortable? Or just more aesthetic? how do you properly maintain merino wool? How do you wash it, which detergant to use, do you iron clothes made of merino wool? I only wash it occasionally, maybe once a year depending on use. It should be washed by hand or on a very delicate cycle, cold. And then most importantly, it should be dried by rolling it in a towel to remove most of the water, and then drying flat on a rack. Never tumble dry and never dry hanging up, or it will stretch. I was unfortunately unable to order a Medium crewneck before that model sold out. Are you contemplating any immediate restocks or have you, by any chance, recently received a M as a size exchange that would be available for purchase? Thank you in advance for taking the time to filed my inquiry. The next batch won’t be coming until the Autumn, but I’ll put you down on the waiting list just in case we get a M crewneck return from someone. Are there plans to restock on sold-out sizes? Yes, but not until the Autumn. Thanks, Simon. Could I place a pre-order and perhaps a 50% deposit to reserve a piece? I’m afraid we don’t work like that, but I can certainly start to put together a waiting list so you are emailed as soon as it is available. Thanks Simon, that would be great. I’m chasing a V-Neck in a size L. Trust you have my email details? Hey Simon, just wondering if you’ll be restocking this month? Hope I’m on the waiting list, thanks! It will be October I’m afraid. If you have emailed us then you’re on the list, yes! Thanks Simon. Didn’t email you proper, but our convo’s in the chain above. Let me know if you’d like me to email you still? I have a 37-38′ inch chest. Size S of Orlabar Brown tailored polo, size M of Friday Polo and size 38 of finamore shirts fit me well. What do you think my size of this Finest Knitwear is? Look forward to your new batch. Thanks Simon! I wear S for T shirt or polo. (I don’t own a proper Knitwear) But I am not sure if I should size up for a cardigan given I will wear a shirt underneath. 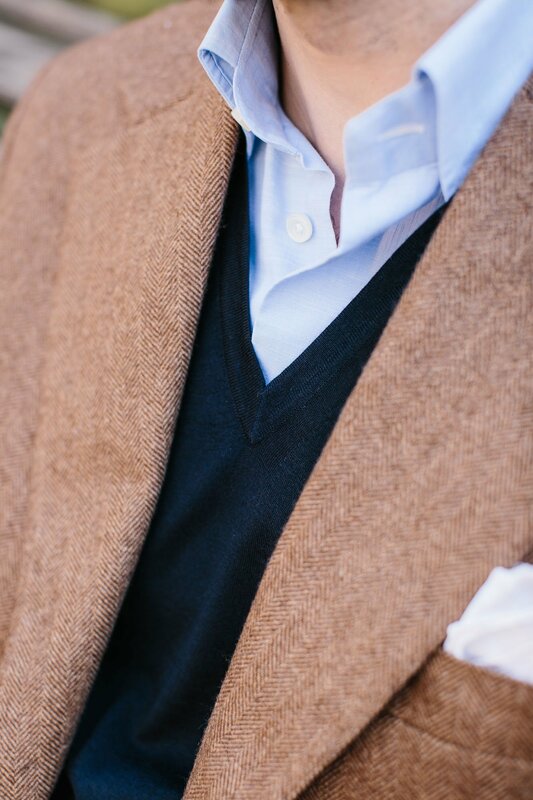 Would you wear a tie under the V neck sweater? Not often, but yes I would sometimes. Generally I would prefer a tie with a sleeveless cardigan.